Hilda-May Latham leads this ladies-only ride through the wilds of Exmoor. This is not a novice- friendly ride due to the amount of climbing (up to 1,000 metres). That said, the intention is to take it easy up the climbs. 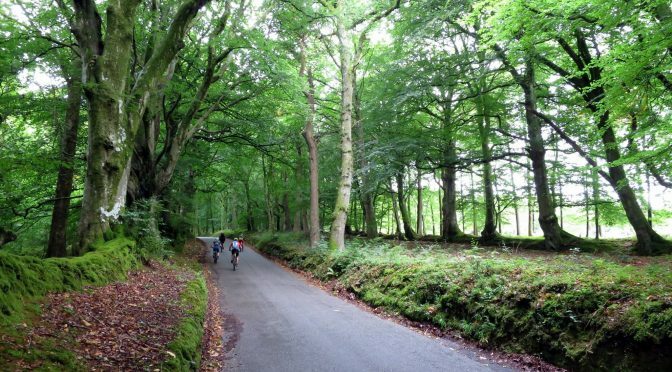 The ride starts in Horner Woods with a steep tarmac climb. We will stop to take a breather and admire the views before a short ascent to ascent across the moor to Dunkery beacon, the highest point in Exmoor. Dunkery beacon is very exposed – not the best place to be in wet, windy conditions – but on a clear day you can see across the Bristol Channel to Wales. We then descend on a mixture of moorland and rocky tracks to the village of Exford where we will stop for lunch in one of the pubs. Lunch is followed by some more climbs back up to Dunkery beacon. From there we follow an awesome 4.5km rocky descent with loose rocks. The final part is downhill through Horner Woods, following the river back to the car park. Once at the car park we can freshen up and grab celebratory cake from the local tea gardens. Arrive in time for a 10.00am start. Bring £3 in change for the car park, lots of snacks, pocket money for lunch/cake and a change of clothes. I’m definitely up for this. I wondered if anyone would want to share a lift. Can’t seem to find the group on Facebook? Terrain/Difficulty: Mixed terrain with some grassy bridleways, road climbs, rocky descents and open moorland. Shops/Pubs/Cafes: Cafe at the beginning/end.